Menulog delivers for Poke Flow so you'll be able to track your courier on a map. Slow cooked pulled brisket, edamame, tomato, cucumber, coriander, roasted capsicum, carrot, pickled ginger, nori, poached egg and spiced kimchi mayonnaise. Free range chicken, tomato, carrot, coriander, crispy shallot, edamame, cucumber, spinach and sesame dressing. 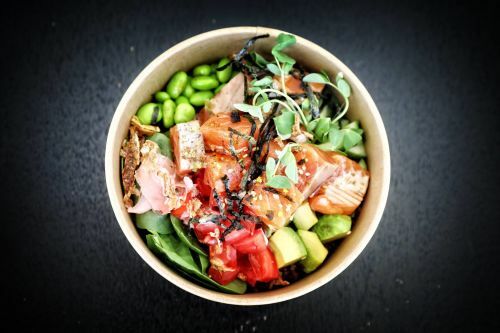 Salmon sashimi, edamame, tomato, cucumber, pickled ginger, cabbage, black sesame, wakame salad, nori, tobiko, radish, shallot and sesame dressing. Seared tuna, edamame, red onion, wakame salad, cucumber, tomato, spinach, carrot, nori, tobiko and sesame dressing. Firm 5 spiced tofu, pickled ginger, sesame, pickled radish, carrot, roasted capsicum, edamame, cucumber, avocado, red onion, coriander and soy dressing. Seared salmon, poached egg, edamame, tomato, cucumber, pickled ginger, spinach, tobiko, nori, crispy shallot and sesame dressing.